It’s true. And I’ve got the receipts to prove it. This month marks the nine-months-to-go-until-the-big-day countdown. Hooray! With the wedding date approaching, Darrin and I took some time during our Christmas vacation to complete some planning duties. One such duty (she said doodie…heehee) was purchasing lighting for our reception site. Enter the bargain bride. We budgeted $100 for lighting (not counting candles). So, the day after Christmas I arrived at my neighborhood Target at 7:00 a.m. Mind you, I am not a serious shopper and I usually avoid major sales/shopping events (as described here). But, I was motivated by a greater desire to stay on budget. Once inside the store, I grabbed a basket and made a beeline for the holiday decor section. But, to my dismay, there were no lights to be found. Nooooooo! I texted an update to my mom and sister, two awesome ladies who agreed to fight the crowds and help me search for lights, and headed off to another Target. In the mean time, my mom also found empty shelves at two different Targets. I was starting to feel anxious and worried that we wouldn’t find lights anywhere. Why-oh-why didn’t I buy them before Christmas when I had the chance? I thought to myself, “Nope. I’m a bargain bride.” And I went right back to my intent analysis of lights – comparing lengths, number of bulbs per strand, bulb brightness, etc. Eventually, my basket was overflowing and it was time to check-out. The lights were 50% off. I spent $78.72 but walked away with over $150 worth of lights! And, did you notice I came in under budget? 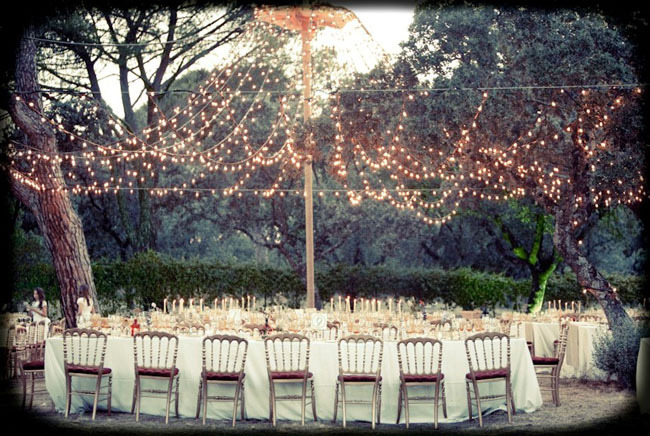 Plus, when the wedding’s over, Darrin and I will have lights for our house. After I made my purchase, I called my mom and sister off the hunt and let them know that I went ahead and spent my budget at one store given the fact that we’d had bad luck at three previous stores. My mom, being the generous lady she is, purchased some more lights for us as a gift anyway. So, we’re definitely set on lights. With all this talk on lights, you’re probably wondering what the heck we’re going to do with them. Well, we’re definitely going to use them to light up the perimeter of our reception site, but there are some other ideas floating around as possibilities. I found these sources of inspiration on (you guessed it) Pinterest. What do you think? While these lights are larger, I love the warm feel of this circus tent-style draping. It creates a beautiful focal point in the outdoor setting. This waterfall effect created with tulle and white lights would be a great way to hide or cordon off areas of the reception site. The mix of white lights and jars would echo my plan for table centerpieces (candles in jars) nicely. While recreating a scene like this is not likely, I am inspired by the warmth of this setting. What I find appealing about white lights is how they can add warmth and a festive feeling all at once. Additionally, I feel like white lights have a magical quality about them, transporting me to a starry place, safe within the confines of the light. Now we just have to figure out exactly how we’ll hang all the lights I scored (and received – thanks Mom!) during my bargain hunting. What about you? Do you have any great bargains you want to brag about? What about tips for bargain brides?